Published September 15, 2014 By Anna T. This post may contain affiliate links. Regardless, I only recommend sites I've researched and/or used and trust. Belay Solutions (formerly known as eaHelp) is a company that uses virtual executive assistants to help serve the needs of their many clients nationwide. The company has been in business since 2010, and back then the focus was on helping churches and pastors outsource admin work. They've since expanded and now service clients across a variety of industries. 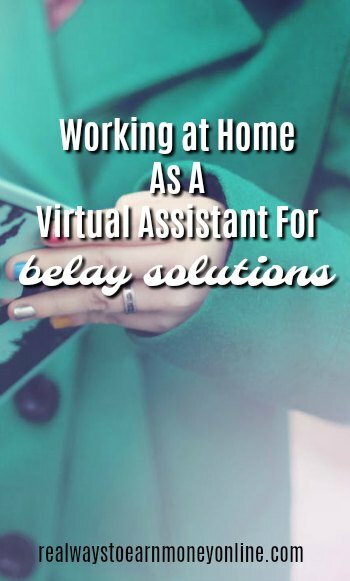 If you are qualified, you may be able to get a work from home job as a virtual assistant for Belay Solutions. The company prides itself on using only US-based assistants and helping to keep jobs in the US rather than outsourcing like many other similar companies choose to do. What kind of work do you do for Belay Solutions? As with most VA (virtual assistant jobs), the sky is the limit regarding the work you do and it will depend on the needs of your client(s). Most of Belay Solutions assistants only serve one or two clients maximum. You may be doing a little of everything for the clients you are assigned to, including making travel arrangements, writing blog posts, updating social media accounts, and more. The company does not publicly advertise their rate of pay, but from what I've read it's more than fair and in most cases should equal a good part-time or possibly even full-time income. Someone mentioned in the comments that pay is $10 hourly, but on Glassdoor, the salary for virtual assistants at Belay is listed as being between $14 and $18 hourly. That said, you will almost always earn the most money as a virtual assistant if you are successful at starting your own business rather than working under someone else. This is independent contractor work, so taxes aren't taken out of your pay. As you most likely know, when you're an independent contractor the company will usually send you a 1099 form at the end of the year showing what you've earned so you can file it with your taxes. Who is qualified to work for Belay Solutions? Belay Solutions wants to hire tech-savvy individuals who know how to get things done. They prefer if you have at least a bachelor's degree along with five years of experience as an executive assistant, project manager, or other similar role. Are you lacking a degree or experience? If so, check out this list of virtual assistant jobs for beginners. Your exact schedule will depend on the client(s) you are servicing and when they need your help, but most likely it will be during typical business hours throughout the day. What do people say about working for Belay Solutions? WAHM and other work at home forums don't offer much in the way of feedback, but there are two very positive reviews from workers at Glassdoor if you want to read them. Belay Solutions also happens to be one of the highest-rated virtual assistant companies at Virtual Assistant Assistant — a website with reviews of these companies from the client's perspective. Even though those reviews focus on things from the other end of the spectrum, I still feel that it's a good representation of the business all the way around. Most of the time you'll find that if clients are happy, workers are happy, too. If you are interested in working as a virtual assistant for Belay Solutions, you can go here to view their “Careers” page and fill out the app. Note that this job is not always posted. Good luck, and please feel free to provide your own feedback on the company in the comments below. Want to make $30 an hour with your own virtual assistant business? While there is certainly nothing wrong with working as a virtual assistant for a company who needs workers, you'll earn the MOST money working for yourself — setting your own rates, deciding what services you'll offer, and getting some high-paying clients! In fact, most virtual assistants who work for themselves earn upwards of $30 an hour. If you're curious about going down this path, be sure to grab Gina Horkey's FREE list of 150+ virtual assistant services you could offer. No strings attached and you'll get a ton of ideas. There is also a FREE Pinterest virtual assistant prep workbook available for those of you who would like to specialize in Pinterest services for your own VA business! I applied over a month ago but haven’t heard anything 🙁 They are local to me. Still hoping to hear from them though! Thank you for highlighting our company (www.eaHELP.com) … we appreciate your review. We strive to serve our clients well and we look for the best of the best in virtual assistants to serve them. Again, thanks! I’m happy to share it. 🙂 Thank you for stopping by! Awesome, a Christian company =). I’ll try to apply even though I live in Canada.